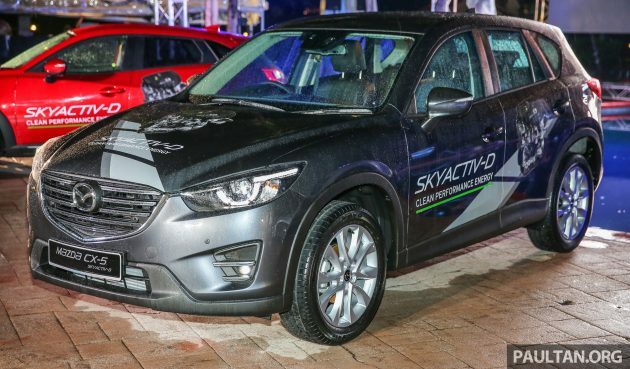 Earlier today, Bermaz introduced the new Mazda CX-5 2.2L SkyActiv-D diesel in the Malaysian market; now the oil-burning C-segment SUV is here at the Saujana Hotel for the official launch event. Available in a sole two-wheel drive variant, the diesel CX-5 is priced at RM161,529 (metallic paint RM161,929) – this makes it the most expensive 2WD model, retailing RM6,763 higher than the 2.5 petrol. Prices are inclusive of a three-year/100,000 km warranty and a three-year/60,000 km free service package. Mazda’s party piece here, as the name suggests, is the 2.2 litre SkyActiv-D twin-turbo four-cylinder diesel engine under the bonnet, making 173 hp at 4,500 rpm and a healthy 420 Nm of torque at 2,000 rpm. 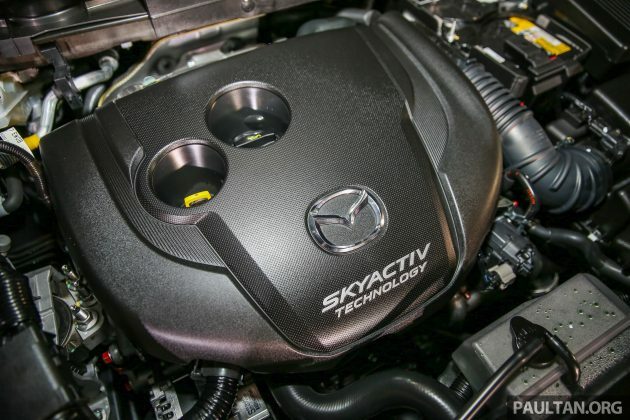 A six-speed SkyActiv-Drive automatic transmission sends drive to the front wheels. The most notable aspect of the engine is that it features the world’s lowest compression ratio for a diesel mill, at 14.0:1. This allows for a lower weight, improved fuel consumption and reduced nitrogen oxide (NOx) emissions compared to a traditional diesel engine. As such, the diesel CX-5 meets stringent Euro 6 emissions standards – crucially, without the use of expensive aftertreatment systems such as urea injection. Local cars retain a diesel particulate filter to weed out soot and other diesel particulate matter from the exhaust, making it one of the few diesel models in Malaysia to do so. Berjaya Auto CEO Datuk Seri Ben Yeoh said that it was “advisable” to fill the car using Euro 5 diesel; cars using the high-sulphur Euro 2M may require shorter service intervals, while the use of B10 biodiesel could void the warranty entirely. Specs-wise, the diesel CX-5 is nearly identical to the 2.5 litre petrol variants – the exterior gets adaptive LED headlights with LED daytime running lights and auto levelling, LED tail lights and 19-inch alloy wheels. It’s the same story on the inside, with keyless entry, push-button start, an i-Stop auto start/stop system, cruise control, auto lights and wipers, an auto-dimming rear-view mirror, leather upholstery, an eight-way power-adjustable driver’s seat, dual-zone auto climate control and an MZD Connect infotainment system with navigation and six speakers all shared with the 2.5. The biggest differences in spec compared to the rest of the range is in terms of safety – the CX-5 diesel is the only one to get a range of i-ActivSense driver assist systems, including Smart City Brake Support (SCBS), Blind Spot Monitoring (BSM) and Rear Cross Traffic Alert (RCTA). This adds to the CX-5’s already comprehensive range of standard safety equipment, including six airbags, ABS with EBD and brake assist, Dynamic Stability Control (DSC), ISOFIX child seat anchors and a tyre pressure monitoring system. We’ve driven the Mazda CX-5 2.2L SkyActiv-D diesel in Thailand recently – you can read the review here. Surprise the kunta yet to come here to out copy paste story then thumb up own comment. I hope buyers buy this because of the diesel torque and not buy this car to get diesel savings. If you are buying this to save money, you will lose more. Firstly, a petrol CX5 OTR and after discounts is RM125k. That is about RM40k cheaper. Are you going to use RM40k worth of fuel??? This diesel which you bought for RM162k, you will have to sell it for RM80k. A depreciation of RM82k. Don’t believe, go and see the Santa Fe diesel prices. So after 2nd year, when you sell your car, you would have lost RM40k (initial premium over petrol) + Rm80k depreciation. You just lost RM120k. Fuel savings no more! secondly, why u like to sell ur car in 2 years? u are not afford to pay ur installment and bank want to tarik ur car? this is japanese brand, how can u compare to korean RV? RM40k is nothing for those who afford to buy. He is drinking milk with sam loo at empty showroom lah. 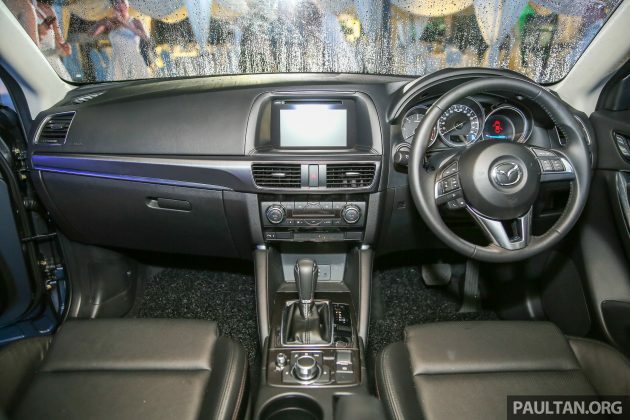 Mazda Malaysia scored a stupid own goal by not making it available as a 4WD but rather an overpriced 2WD. 2WD is overpriced to u already, 4wd u afford meh? Check article properly. Ceo said use of b10 could void the warranty!! Let’s hope Mazda will continue to bring in proper full spec cars instead of skimming on spec and short changing their earlier supporters.